The warm weather is finally here! Well, on the Island, that is. Today and the past few days have been absolutely glorious - so beautiful and sunny. And HOT. Quite honestly, it feels more like summer than spring. I don't want to complain about this gorgeous weather, but it's totally obvious when I get dressed in the morning that I'm so NOT ready for this heat!! Eep! I definitely have some warm weather shopping to do! How about you? Are you prepared for the warmer months? While I do some planning on my "warm weather capsule wardrobe", how about we do a Spring edition #CraftyBlissChallenge? Sounds like fun, yes? I'm pretty excited! The first challenge that Julie (of Knitted Bliss) and I ever hosted was so fun and so inspirational that we decided to do another! If you're new to my blog you can read about the challenge we had last fall here. If you've just joined or never participated in an Instagram challenge before it's a challenge that spans for a set number of days and each day you are given a photo prompt that you can interpret in any way you want, then take a photo and share it on your Instagram account. Our prompts are broad and not knitting specific, which means anybody can join in on the fun! Like our last challenge, the Spring edition will also be 10 days long and will commence on Friday, April 22nd and will wrap up on Sunday, May 1st. Julie and I would love it if you could join us! To participate: Obviously you will need an Instagram account, it's free to sign up! Then for 10 days all you have to do is get creative, take photos daily, add captions (or not, it's totally up to you! 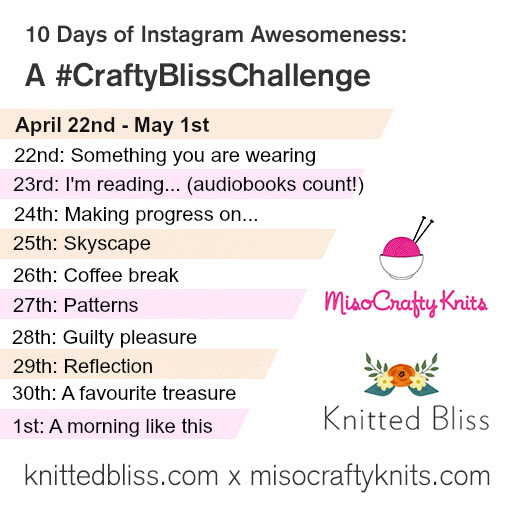 ), tag each photo with our special hashtag - #CraftyBlissChallenge, and share! To make life easier on yourself, you can save the image above or bookmark this post in your web browser and come back every day of the challenge to help you remember the prompts. Please note: if your account is set to private, neither Julie or I will be able to see your images!! So if you want to participate please set your account to "public" so that we can enjoy your photos and comments, and then when the challenge is over you can switch back to private. Julie and I will be popping in a few times daily to share our own photos and to check out what people are posting via the hashtag feed. 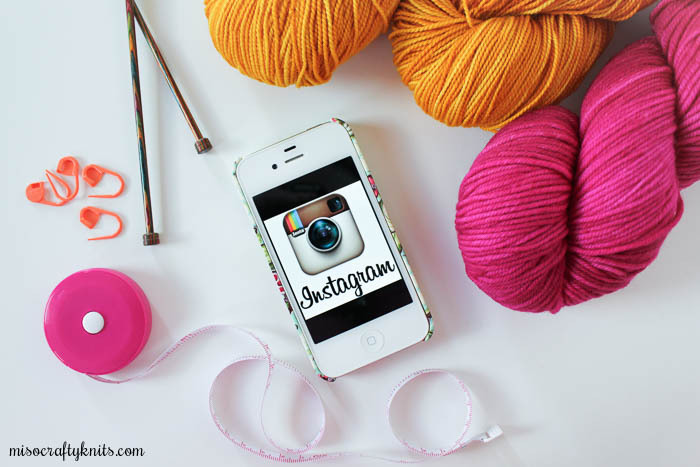 Follow both of on Instagram: Julie is @knittedblissjc and I'm @misocraftyknits to see our takes on the daily prompts (or to check out our feeds in general). Even if you don't want to or simply can't participate, I hope you will still follow along on the challenge and see what everyone is posting. A great little community forms and it's fun to get inspired, meet new people, follow new accounts, and yes...possibly add to your stash and queue! To add to the fun, two randomly selected participants who have completed all 10 days of the challenge will be chosen to win some knitterly goodies!! Who doesn't like goodies? Especially when it involves yarn? So remember to tag each photo with the hashtag #CraftyBlissChallenge so that Julie and I can see your photos and follow along on your challenge progress. Looking forward to this!! I had so much fun last time, & it's great to think outside the box when looking at things!! It's supposed to be Autumn here, but like you still warm during day (enough to swim in) but at least the mornings are becoming more cooller. Got my socks out for the 1st time to wear..yay!! hooray!! this is going to be so much fun!